Investors who had hoped that the resolution of Italy's budget showdown with the EU would mark an end to a volatile period for Italian bonds and stocks were disappointed Wednesday when fears about an Italian banking crisis reemerged after the ECB appointed a slate of temporary administrators to oversee troubled Italian lender Banca Carige after nearly its entire board resigned. Earlier on Wednesday, Consob, Italy's market watchdog, said it had suspended trading in shares of Banca Carige for the session following a request by the bank, according to Reuters. 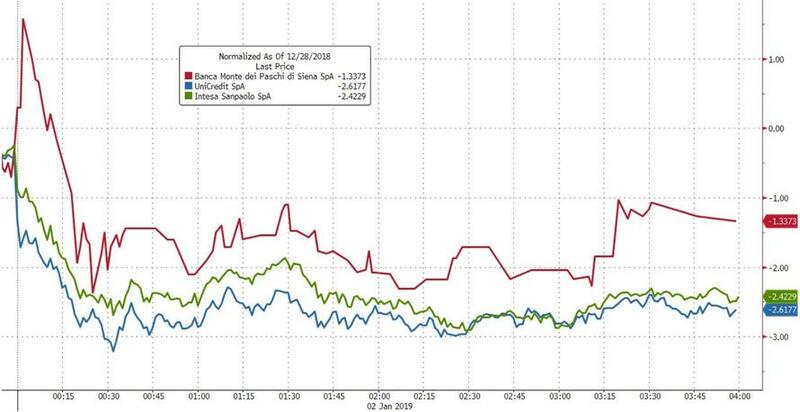 European bank stocks dropped while bonds rallied as fears about softer-than-expected factory orders across the Continent were compounded by the developments in Italy (which proved an exception to the trend of weak PMIs). With the bank teetering on the brink of insolvency, the ECB appointed three temporary administrators and a surveillance committee to "take charge" of the lender. The board quit after the bank missed a deadline to shore up its finances, or find a buyer or merger partner, after a fraud scandal, according to the Financial Times. Fabio Innocenzi, Pietro Modiano and Raffaele Lener have been appointed as temporary administrators while Gianluca Brancadoro, Andrea Guaccero and Alessandro Zanotti have appointed as members of the surveillance committee. The "unprecedented" move - as Bloomberg called it - follows a failed attempt to raise some 400 million euros last month after the Malacalza family, the billionaire shareholders who control nearly one-third of Carige, abstained from a vote on a turnaround plan, which sought to fill the capital hole left by the fraud scandal. The ECB said it had to take action to "stabilize its governance and pursue effective solutions for ensuring sustainable stability and compliance," the central bank said. Independent administrators have been removed, and the bank's new overseers will "continuously" report back to the ECB. If the necessary, the administrators must take "action to ensure that the bank restores compliance with capital requirements in a sustainable manner." The decision to put the bank into administration is widely seen as a forerunner to a possible sale or merger. 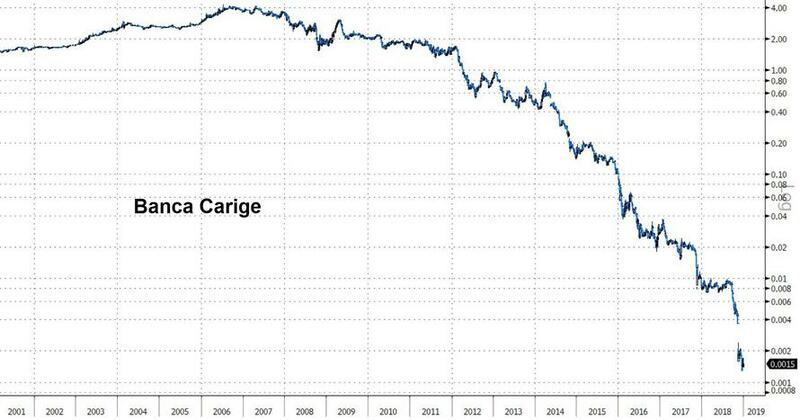 According to Bloomberg, the ECB has repeatedly recommended that the bank find a buyer, with Unicredit floated as one possible option, as Carige remains one of the few medium-to-large Italian lenders that hasn't dealt with its NPL problem.